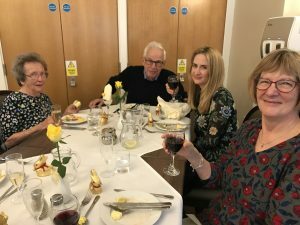 This Sunday saw the very popular Family and Friends Sunday lunch return to Valerie Manor. For those that haven’t attended we change the layout in the restaurant to allow all the residents guests to get to know each other. One of the guest was celebrating their birthday as well and so the ever resourceful team in the kitchen improvised a birthday cake and a rousing chorus of Happy Birthday was sung with a Sherry before the meal. 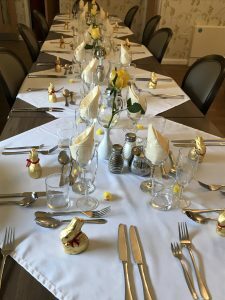 A huge thank you not only to the kitchen team but also to all of our fantastic staff for their efforts on the day to make it once again a very special time for everyone. It was a very opportune time to share some very exciting news with everyone! 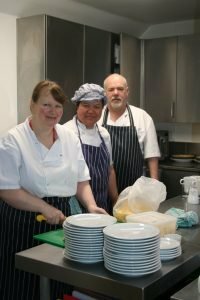 The Kitchen team have been short listed for Best Food, Nutrician and Dining experience and the Care team for Best Nursing Care – this is such an amazing achievement in itself but we hope to take a large number of the team to the awards in London later in the year! 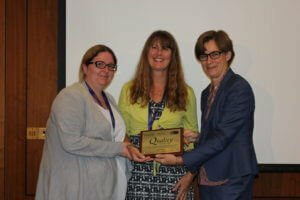 CQC Rate Valerie Manor Outstanding! This week led to more fantastic news here at Valerie Manor. 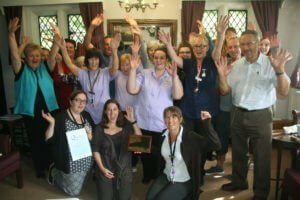 In 2015 we were the first home in West Sussex to receive an Outstanding Rating from the CQC and had our unannounced inspection in August this year. 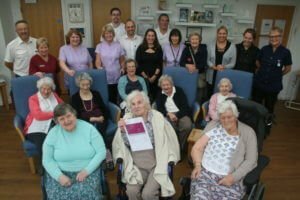 Our report has now been published and I am delighted to say that we have received another overall Outstanding but this time receiving the rating in 4 out of 5 of the Key Lines of Enquiry – Caring, well led, Safe and effective and this is something that we are all very proud of here at Valerie Manor! I could not be happier that we have received this accolade as the dedication and hard work of all the staff here is what makes it the home that it is and I could not think of a better way of recognising what the staff do. I look forward to celebrating my 10-year anniversary in January 2018 and to have the Outstanding rating ahead of this time is very special to me. In November we will also be attending the National Care Home Awards in London where we have been shortlisted for the National Care Team of the Year and I am honoured to have been short listed for the National Registered Manager of the year – Just to be one of 5 National Finalists in each category is something that we are all thrilled and excited about! We would like to thank all of the health care professionals who support Valerie Manor including all the staff at Steyning Medical Practice, Upper Beeding Pharmacy and St Barnabas House to name but a few! We would also like to thank the local Community for the support they provide to our staff and residents – We couldn’t do what we do without you. Everyone at Valerie Manor pride themselves on the care we provide to the residents throughout their time here, but especially towards the end of their lives. 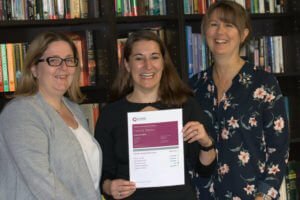 You may be aware that we have been involved in a National initiative called the ‘Gold Standard Framework’ (GSF) for several years and were thrilled to be awarded ‘Commended’ Status on our first accreditation back in 2014. Emma & Alison recently attended the GSF Awards in London, on behalf of the whole team and were proud to be presented with the ‘Platinum’ Award for continuous high standards in the care we provide at the end of somebody’s live. As you will see from the photographs below Emma & Alison returned with the award and we celebrated with the team. I am delighted to announce that the Team at Valerie Manor have been selected as finalists for the National Team of 2017! I am so proud of everyone and delighted that their hard work and dedication has been recognized. I was also surprised and thrilled to hear that staff, residents and relatives nominated me for the Registered Manger of 2017 and I have also been shortlisted. I must admit that when I read through the nominations I cried as the things that everyone said were just so lovely. The nomination meant so much to me. Winners of the National Care Awards will be presented with their trophies by David Baddiel at the high profile Gala Night held on Friday 24th November at the Hilton London Metropole Hotel, attended by over 700 guests.